Please contact Paula (purrfactor@austin.rr.com) for more information about this pet.Hello, my name is Zira. Once upon a time I was a street kitty in San Antonio, and had 5 sweet kittens. My babies were only a few days old when a dog marked all of us for its next conquest. I was doing my best fending it off when a very nice person scooped the 6 of us up. That's when we found our way to ASR and the loving people there. We arrived in early April, gosh 5 months ago now; and all of my babies have gone to their forever homes. At the time, I wasn't very sure of these new faces who were helping me take care of my babies and this whole living inside thing was a little confusing. Needless to say I love being inside; I don't get wet or hungry, hot or thirsty and I don't have to find a safe spot at night to sleep. I get all the wet and dry food I could want, lots of water, treats, a litter box and a soft cozy place to sleep. 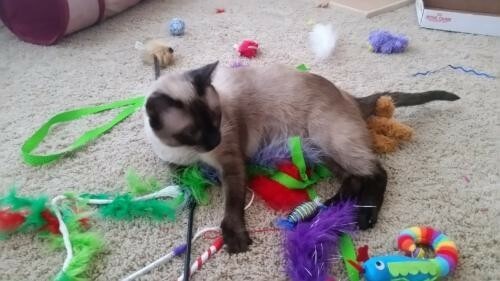 Foster mom even taught me how to play with this thing called a wand toy and boy do I love it, so much that sometimes I run and dive head first into them and hoard them while we play. I also love to get pets and snuggles from foster mom, I'm learning that laps are pretty cool but, am still learning. I love to sit beside her and purr she says nice things to me about being sweet and a good girl; she says I don't have to worry about people trying to hurt me any longer. Wow, does that sound pretty great. One pesky thing about living on the street is that I am FIV+, it isn't a bad thing I can still live with humans and have no issues (foster mom included a link at the bottom), I just need regular vet checkups and a little extra TLC, if I get sick. Foster mom said that all 5 of my babies tested FIV- at 6.5 weeks old which is pretty unusual if I was truly FIV+, but will need to get another test to be sure. Would you consider letting me come home with you and get the pampering that I would love? ****http://bestfriends.org/resources/fiv-cats-faqsVisit this organization's web site to see any additional information available about this pet.